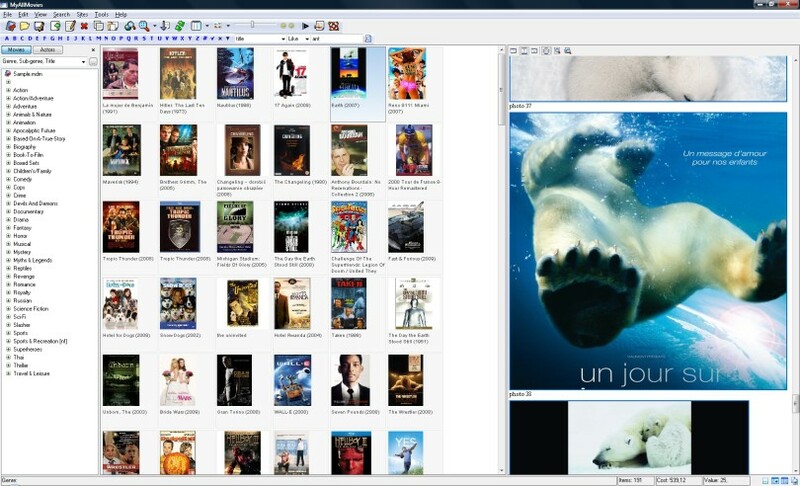 MyAllMovies is a great movie manager, it can handle HD DVD's, DivX's, VCD's, DiVX files, Hi8 and VHS tapes. Adding new items is very effective because movie details, cast, awards, pictures, postres, trailers are grabbed from the web. It also does the same with actor's info. The result can be very handy sorted, searched, grouped, exported to HTML, printed and more. Try it freely and injoy all nice features this application can offer. Qweas is providing links to MyAllMovies 1.7.2 as a courtesy, and makes no representations regarding MyAllMovies or any other applications or any information related thereto. Any questions, complaints or claims regarding this application MyAllMovies 1.7.2 must be directed to the appropriate software vendor. You may click the publisher link of MyAllMovies on the top of this page to get more details about the vendor.